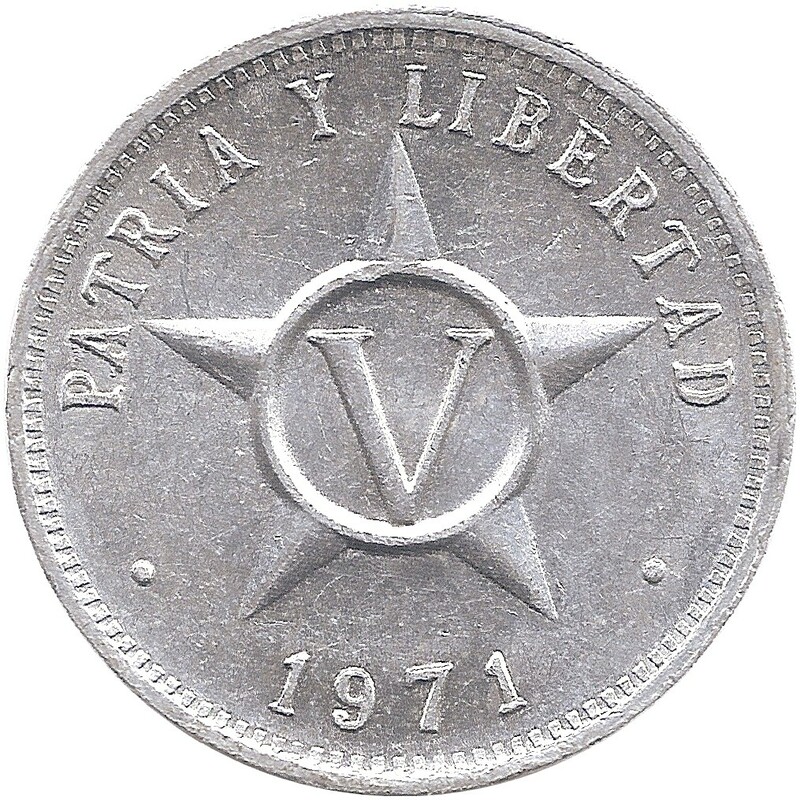 Al 971.5‰; Mg 25‰; Mn 3,5‰. 1972 coins started circulating on the 90's; that is the reason why no coins were minted between 1972-2001. 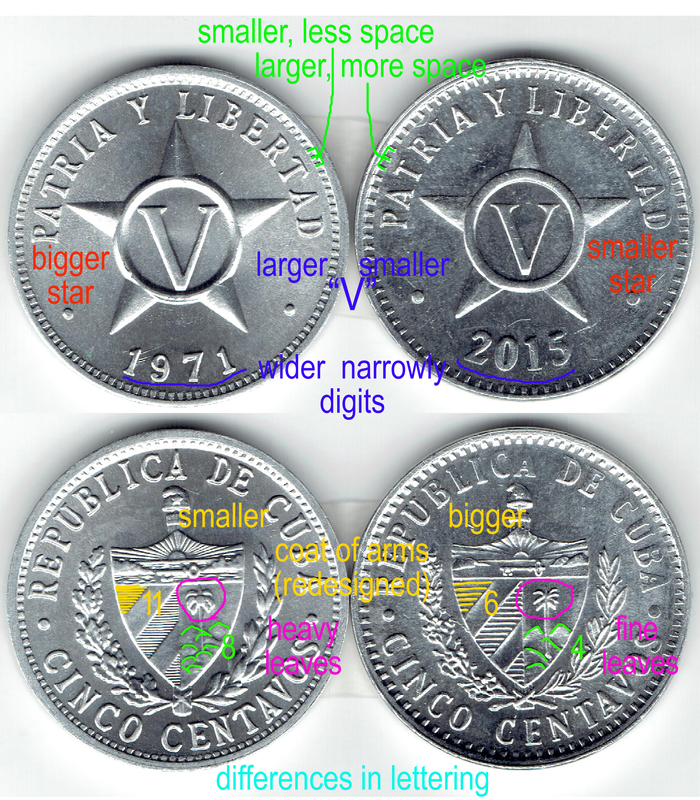 2002 variants: High date on left, low date on right, distance from date to edge is different. 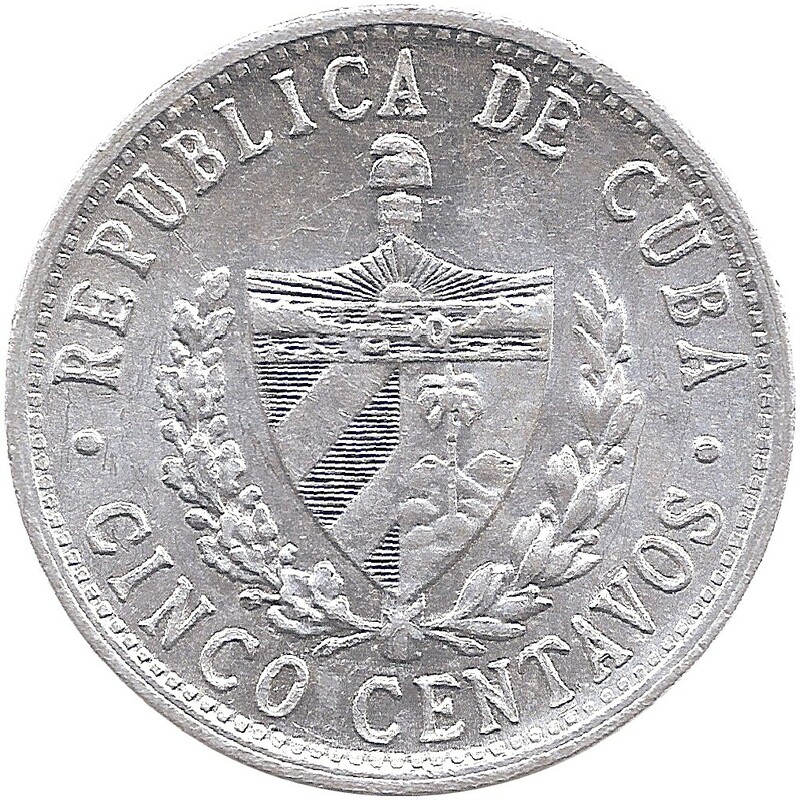 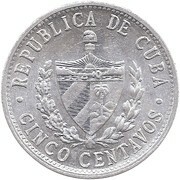 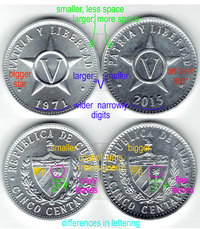 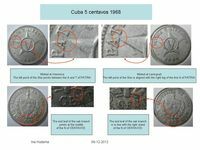 On 2016 legend was changed from "PATRIA Y LIBERTAD" to "PATRIA O MUERTE", this legend have been changed on 1 and 2 cents coins on 1983, and on 20 and 40 cents on 1982, but remained unchanged in 5 cents value. 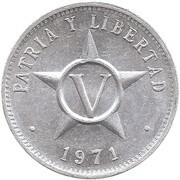 1963 80,000,000 0.23 0.44 0.66 KM# 34 "PATRIA Y LIBERTAD"
1966 50,000,000 0.24 KM# 34 "PATRIA Y LIBERTAD"
1968 100,000,000 0.12 0.19 0.31 0.50 KM# 34 Kremnica Mint "PATRIA Y LIBERTAD"
1968 103,000,000 0.13 0.19 KM# 34 Leningrad Mint "PATRIA Y LIBERTAD"
1971 100,020,000 0.30 0.28 0.44 1.86 KM# 34 "PATRIA Y LIBERTAD"
1972 100,000,000 0.28 KM# 34 "PATRIA Y LIBERTAD"
2002 14,830,000 KM# 34 high date "PATRIA Y LIBERTAD"
2002 KM# 34 low date "PATRIA Y LIBERTAD"
2003 62,520,000 KM# 34 "PATRIA Y LIBERTAD"
2004 62,520,000 KM# 34 "PATRIA Y LIBERTAD"
2006 62,520,000 KM# 34 "PATRIA Y LIBERTAD"
2007 62,520,000 KM# 34 "PATRIA Y LIBERTAD"
2008 KM# 34 "PATRIA Y LIBERTAD"
2009 KM# 34 "PATRIA Y LIBERTAD"
2010 KM# 34 "PATRIA Y LIBERTAD"
2013 KM# 34 "PATRIA Y LIBERTAD"
2014 KM# 34 "PATRIA Y LIBERTAD"
2015 KM# 34 "PATRIA Y LIBERTAD"
2016 NO KM# "PATRIA O MUERTE"
2017 NO KM# "PATRIA O MUERTE"